List Enthusiast has a really awesome infographic about the history of videogames which they’ve allowed me to republish with their permission. I had no idea about some of these early gaming inventions and the impact they’ve had on gamers over the past 60 years. Did you? Which era of gaming is your favorite? This infographic leaves off my personal favorite era of gaming, which I would call “Console Gaming” – It starts to dabble into the history a bit, with Atari but then it jumps to Dreamcast? That leaves out the Super Nintendo, Sega Genesis (and peripherals) that defined the 16bit and 32bit era as well as the predecessors the Saturn and N64 which will always be among my favorite gaming platforms. Still it’s a really interesting look at where gaming’s been and where it’s going. We’ve done a few articles already on VR gaming and there’s no doubt it’s going to be the “next big thing”; and it’s already here and this is only the beginning. Also take a look at those stats at the end of the infographic! 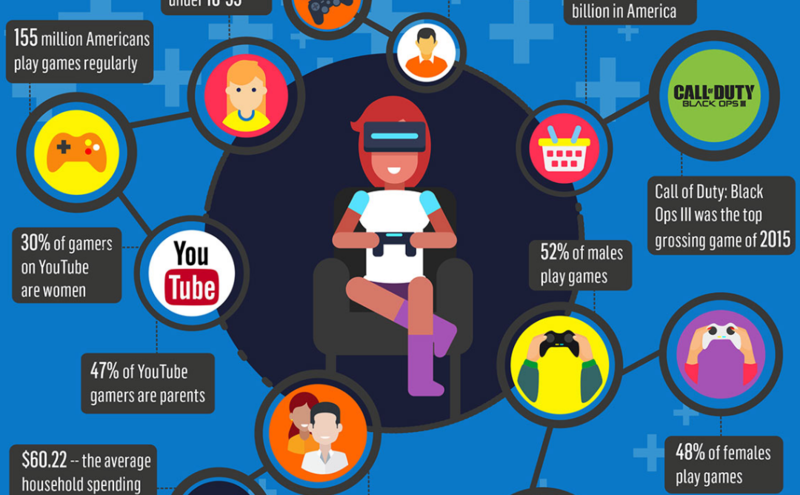 The average age of gamers in the USA is 35! and that’s exactly how old I am too! Yay for old/retro gamers. We rule :). There’s also stats about how 4 out of 5 households in the US have at least one gaming console.